At last the ceramic plaque community-project that I was working on six years ago has come to fruition! Though it was all finished by the beginning of 2012, the problem was securing the place for it to be displayed. At first, we thought it might be in a public garden, but the authorities at Birtley (near Gateshead) have worked hard to get the permissions and find a suitable site for it, and it is now proudly presented in Birtley Library. An artwork that remembers some of the great icons of Gateshead’s past is now on permanent display at Birtley Library. Working with a professional artist, Birtley Heritage Group members came together to create the piece, which records their personal feelings about the history & landscape of their district. 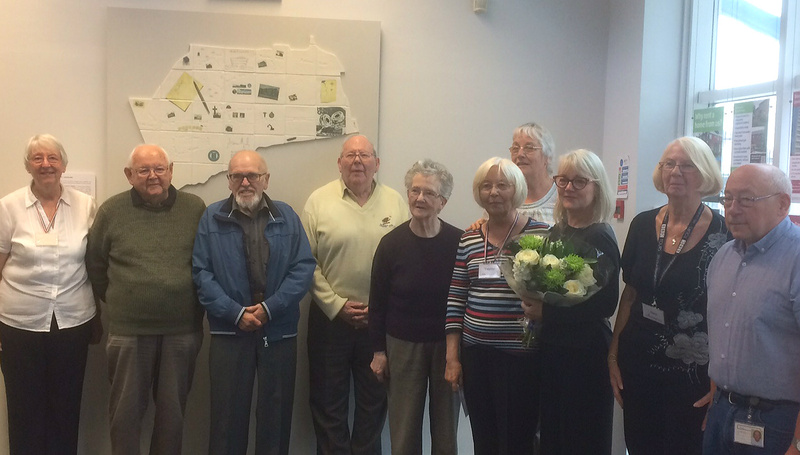 The group’s chairperson Yvonne Armstrong said: “We are absolutely delighted that the Birtley Landscape artwork is at last on display in our own local library. Thank you to our councillors, whose community fund helped us to get it installed. 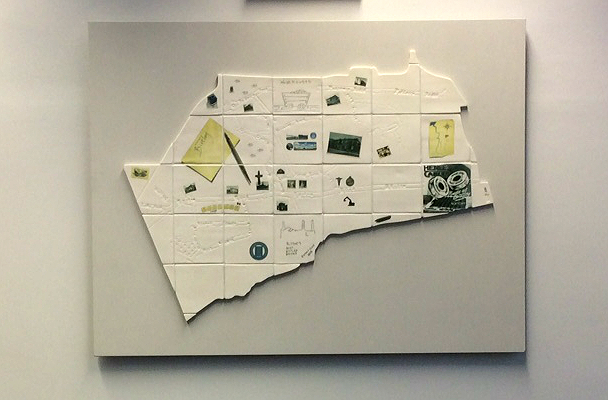 The artwork is made up of porcelain tiles, all forming a map of Birtley district. Fired into the tiles are depictions of aspects of the area that the group members thought were important to them – such as its coal mining industry, the Royal Ordnance Factory [originally the site of the Projectile Factory, which operated during the Great War], and historic houses such as Birtley Hall built by John Dobson in 1815. Yvonne said: “We hope that by depicting only a small range of Birtley’s history on the map, it will jog memories and promote discussion about other aspects of Birtley’s fascinating and unique heritage”. The group worked with Helena Seget, the award-winning Newcastle ceramic artist, whose works can be seen in galleries across the world. Helena said: “It was an honour for me to work with Birtley Heritage Group – to learn about the town about which they’re so passionate and to share with them my passion for art. Community artworks such as the Birtley Heritage Map arose out of Gateshead Council’s Arts Development Team 2010 ‘Soul Soup’ project (itself a response to the ‘Generations Together’ initiative, originally set up by the Department of Education). ‘Soul Soup’ was a way to bring communities together: to build trust, promote well being and also to address negative perceptions of age, through arts activity. I must admit it was a happy time working with the ladies and gentlemen, and I learnt a lot about life as well as ceramics. Thanks to Denise Envy, the Birtley Library manager for the photos. ).